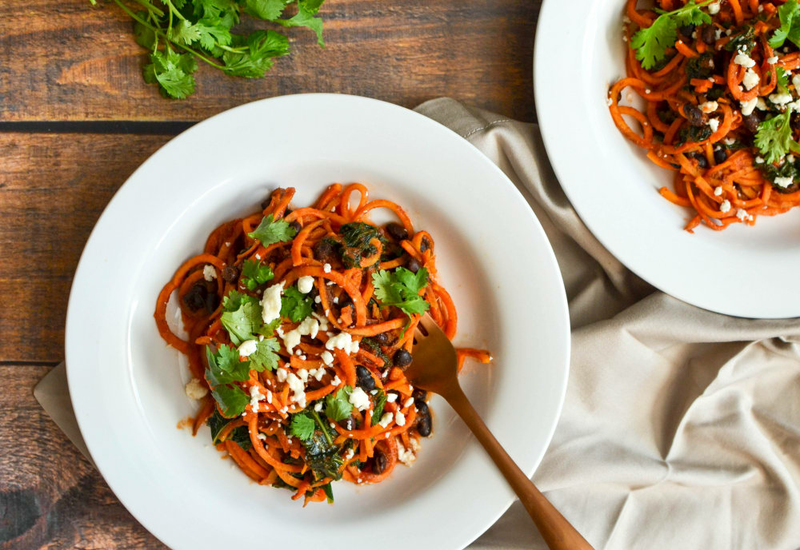 Our spiralized sweet potato enchilada bowls are made with black beans and kale. This low-carb twist on a Mexican favorite is healthy, simple, and quick to prepare! Per Serving: 256 calories; 4g fat; 45.9g carbohydrates; 13g protein; 8mg cholesterol; 1131mg sodium. I made this recipe and it was surprisingly delicious. The homemade sauce was amazing, I really loved the use of the chipotle pepper and adobo sauce. It wasn't too spicy but definitely had a kick to it. The kale was also a plus! Sweet potato noodles are my favorite because they are so versatile. This recipe was easy and delicious. Very good sauce. Perfect for a quick lunch or light dinner. Surprisingly delicious spiralized vegetarian enchilada bowls. The sauce blew me away. Definitely going to be my go to recipe for traditional enchiladas as well. This is one of my favorite recipes for Meatless Mondays. This sauce is perfect! I used two chipotle peppers because I like my food extra spicy. I think I'm obsessed with spiralized sweet potatoes now. I made these for some gf friends and we all loved it. It was really easy to throw together at the last minute too. My only complaint is that I had to dirty two pots. If I could find a way to make this in a single pot I would make it more often.